Ten plus pounds of the freshest wild caught seafood on the planet. This pack contains a variety of Salmon, Halibut, Colossal Red King Crab and Kodiak Scallops – all from the Gulf of Alaska and the Bering Sea Perfect for celebrations with family and friends. SKU: 11105. 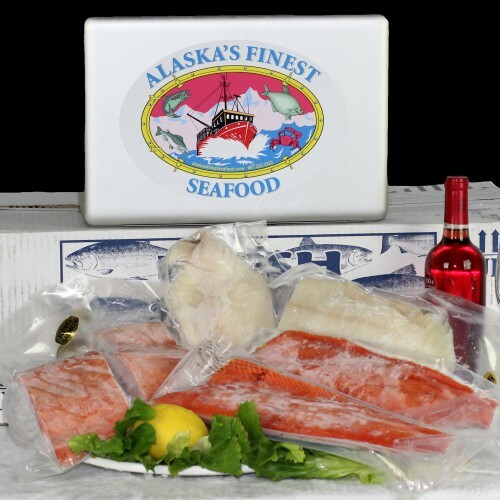 Categories: Alaskan Halibut, Alaskan Halibut, Alaskan King Crab, Colossal, GIFT PACKS, Salmon. The nutritional benefits of Alaska Seafood can - and, in fact, do - fill volumes. In addition to providing an excellent source of high quality protein that's low in saturated fat, Alaska Seafood is rich in many essential vitamins and minerals.Alaska Seafood is "smart for the heart." Traditional Asian, Mediterranean, and Greenland Eskimo diets are rich in seafood. These populations have a discernably lower incidence of cardiovascular disease. The average life expectancy in Japan - where seafood is a major part of the diet - is 79.Naturally high in many essential vitamins, Alaska Seafood contains vitamins E, C, D and A. Some varieties are very high in antioxidant E, which has proven to strengthen the immune system, and lower the risk of heart disease by reducing buildup of plaque in coronary arteries. Current studies reveal possible protection against cancer and the formation of cataracts. Some species also have vitamin C (another antioxidant), vitamin D, and vitamin A is also found in many seafoods.Alaska Seafood contains a wide variety of minerals (including zinc, iron, calcium, selenium). Canned salmon that includes the soft edible bones is a particularly rich source of calcium, and is a wonderful choice for people of all ages, including children who don't consume dairy products but need high amounts of calcium to build strong bones.Alaska Salmon, for example, offers exceptional nutrition. Its high concentrations of Omega 3 oils, now proven to substantially reduce the risk of coronary disease. Omega 3 has also proven to be beneficial in the treatment and prevention of many other diseases. (See Omega 3: An Ounce of Prevention and a Pound of Cure).